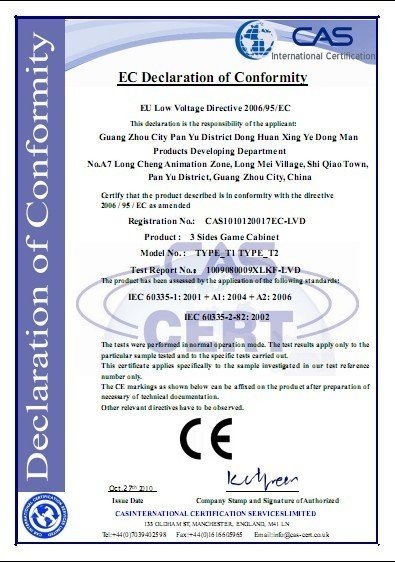 Company Overview - Guangzhou Lu Xing Animation Technology Co., Ltd.
6YRSGuangzhou Lu Xing Animation Technology Co., Ltd.
Guangzhou Lu Xing Animation Technology Company is a professional manufacture for developing and producing game machines. We love amusement game machine, also we pay lots attention on amusement game machine. We play Arkanoid game and pinball machine since 80's, in the following time, we experienced different kind of games. For example, PAC MAN developed by Namco, a game with single joystick. In 86's, there has been teh Street Fighter developed by Capcom and the King of Fighter developed by SNK, also the Virtual Reality game developed by SEGA, which is also become a mainstream in games industry. Until now, China has developed many kinds of 3D Video games. We deeply hope that every player in every generation would have opportunity to share their feeling after playing a game. Sometimes people would miss the games that we played in old days, and worried about that we may not have chance to play them again. Fortunately, a group of enthusiastic players invented a "Game Simulator". They preserve the old games on website. In this way, people could play the old games once again! Due to there are players used to play a game with a joystick, we develop one series of PC board that are more stable and cheaper and could be fit with the MAME system game. We also develop Japanese version and Korean version both can fit with more than 2000 classic games, and the British version can fit with more than 5000 classic games. Isn't it exciting? As for the virtual reality games, we also develop Circuit Board in order to fit with the games. We hope every player could enjoy in every game after using our hardware products, and also we are looking forward to work with enthusiastic players to create new equipments in the future. In Xing Li, there are many kinds of product. If you are interest in our products, please contact us, we are happy to have your attention.